Given their constant state of edgy flux, The Fall has often resembled the rotational nature of a large football team. Even Mark E. Smith has levelly compared himself to Sir Alex Ferguson and while that comparison may seem rather lazy, there have remained similarities. Trusted musicians pulled from the heart, occasionally replaced by nervy recruits; back-room friction with implosive consequences. The constant pressure of performing beneath a benevolent despotism. There is, as Jeffrey Lewis infamously monologued, "no other band quite like The Fall". Much to Smith's chagrin, this transitional history has thrown up a number of classic line-ups. Indeed, to an often tedious degree, long term fans love to debate the golden moments served up by various knots of musicians that have existed along this fractious time-line. It is a matter of opinion, but I would suggest (like Manchester United perhaps?) four truly inspirational versions of The Fall (with the present gathering just slightly off that pace). For myself – come at me, die-hards – sitting almost at the peak of this unholy list must be the twist of the Millennium line-up featuring Smith, guitarist Ben Pritchard, bassist Jim Watts, drummer Spencer Birtwistle and the early sightings of Elena Poulou. It is almost the band who this writer caught at Blackburn King George's Hall in September 2002 and the powerful 'greatest hits' set they blasted out that night, later caught on live DVD, ranks as the finest performance I had witnessed since 1978, when it was a whole different ball game. This Mark E Smith-sanctioned release almost captures that favoured moment and, indeed, would have done, had Elena's USA Visa situation been suitably rectified. As it was, she remained in Prestwich, while the notorious lo-fi circus that is The Fall's touring machine returned to the country that had retained a random and unpredictable live following. (Huge in Seattle, disregarded in St Louis etc). Fortunately, San Francisco, as the review-like sleeve notes confirm, proved particularly welcoming. In truth, there are far too many Fall albums. Too many official studio releases, let alone live albums, compilations and myriad bootlegs. I speak from experience, having once compiled a 'Complete Guide to the releases of The Fall'. A thankless task indeed. Complete? Who is to say that a Fall Live From Ljubljana won't turn up the next week? Even Smith remains blissfully unaware of just how many are truly out there. Not, one senses, that he cares. 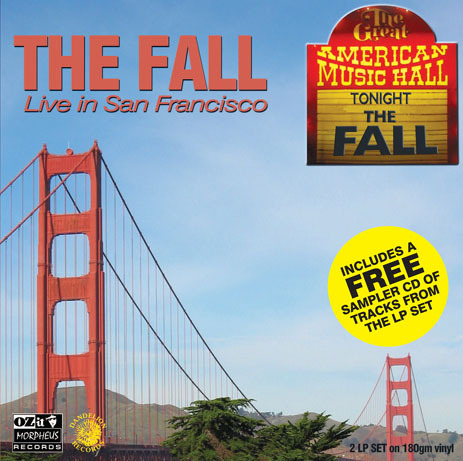 The problem with all this is that a Fall live album is something of a lottery. The chances of catching the right band, on form and with clarity of sound are miniscule, to say the least. Fall fans will concur; I am sure, as many such promising items languish dustily at the rear of their collections. Fortunately, this one bucks that trend. Not that it is perfect. Far from it, but how could you have a perfect Fall live album? But this offering, from John Peel's old Dandelion label (Now reinvented by Ozit Morpheus man, Chris Hewitt, who recently survived the traumas inherent with promoting the band, at the alternative Festival at Minehead and elsewhere), seems to strike the perfect balance. Perhaps emboldened by the lack of Elena, the band lock into an infectious groove, allowing Mark to wander through the gateway to his own melodic universe. This he achieves with typical aplomb. In places – 'Bourgeois Town', 'Foldin' Money' and a stubbornly repetitive 'My Ex-Classmates Kids' – he pushes through to the extreme and, with vocal histrionics that could rival Mariah Carey, he would be unlikely to discover new converts. By contrast, his celebrated smoking drawl of 'And Therein' marries the Midwest with outer-Bury. One glance at the set-list is enough to set the pulse racing. . All the glories from and before that era lay in wait. Among them, 'The Joke', Cyber Insekt', 'Two Librans', 'And Therein', 'Touch Sensitive'. Well, that is just Side One. (And what a joy it is to slap stylus to 180gm vinyl at the start of each side). What happens is deceptively simple. I do not know the history of this recording, whether it has been taken from the mixing desk or otherwise. But it doesn't matter at all. A good live album will carry you straight into the heart of the venue and take you through the nuances of set, leaving you not only with a flavour of the night, but the feeling that you have been in attendance. Such is the case here. You can almost feel yourself ordering Corona at the bar as the band surge into powerful opener, 'The Joke'. Glance stage wards, in your minds eye, and witness Smith's crumpled features leering across the audience as he casually hangs his coat on the hi-hat. The band compensate for the lack of Elena's keyboards by significantly upping the pace, Pritchard's guitar slicing into the ether, accentuating the eager musicality. It is not crisp or precise but, and this has not always been the case, it sounds effortlessly spirited. There is another partial band in attendance here. Agent/confidante/manager Ed Blaney, presumably forgiven for fumbling Elena's visa troubles, makes occasional vocal contributions, not least on his own 'I Wake Up In The City', a song that is as Salfordian as it gets. Proud, precocious, driven and ever-so-slightly dodgy. There are downsides. The flip from side two to three sees a confusing continuation before a below par 'Mr Pharmacist' finally grasps the baton from 'Foldin' Money. But the best is reserved for last. Arguably the most strikingly belligerent clipped version of the mighty 'I Am Damo Suzuki' crawls lizard-like into the fray. “…and the drums come in…and they come in FAST' sneers Smith, recalling days spent in his decaying Kingswood Road flat, swirled about by blue smoke, downing a gallon of Boddingtons and slipping into the magical netherworld of Can's Tago Mago. It's a lovely product too. A 12-inch gatefold dream with a 10 track accompanying CD. The package includes a scan of Smith's surprisingly gorgeous rider, the demands of which include 60 Benson and Hedges and two bottles of Champagne. It is actually cheekily swiped from the recent Alternative Festival gig - further proof, as if it were needed, that with The Fall, all is not what it seems.